Mi Casa frontman J'Something has taken on the food world in a big way, as a chef, cookbook author, restaurant owner, host of two cooking shows - Something's Cooking and What's for Dinner - and judge on My Kitchen Rules South Africa. Now, he's tried his hand at a new craft, with the launch of his very own gin brand. 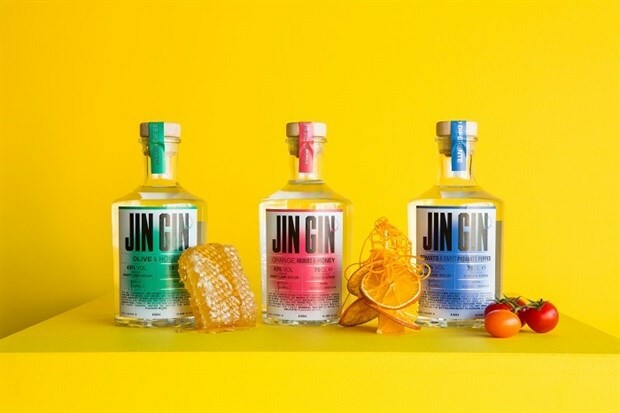 Jin Gin is a locally produced craft gin inspired by J’Something’s Portuguese and South African heritage. To bring the idea to life, he collaborated with gin producers Craft Link – makers of the acclaimed Ginologist Gin – and distributor Beverage Emporium. 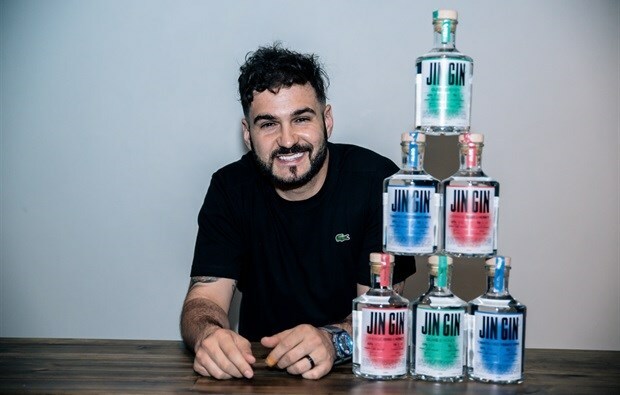 With the tagline Algo Diferente, which is Portuguese for 'Something Different', J’Something (real name Joao da Fonseca) sought to introduce a fresh take on gin in what's become a competitive market. Flavour combinations are a mix of savoury and sweet with Rooibos, Orange and Honey; Tomato and Sweet Piquant Peppers and Honey and Olives. Here, the celebrated muso and foodie shares the inspiration behind his new venture. Firstly, congrats on the launch of your craft gin! What is it that’s attracted you to gin more than other spirits? Firstly, THANK YOU so much! I am still trying to actually believe it myself. Gin is not only a drink that I love but a lot of South Africans also love it and globally it’s probably the biggest drink trend at the moment… But that’s not why I entered the game. To be honest with you all I thought was, "How cool would be it be if we replaced the G from Gin with a J because it still says JIN!" A door opened up for me a year after having this idea with Sherry from Beverage Emporium and I jumped at it because that’s how I roll... I live to try and see my potential. As a chef and cookbook author, there’s no doubting your flair for creative flavour combinations. Tell us about the inspiration behind the three Jin Gin variants. The flavours are really the highlight for me, because there’s no denying that the market is saturated. Now what I needed to do was offer something fresh, different and true to me: that’s always been important to me. So flavour one is Rooibos, Orange and Honey. This is a delicious, easy drinking, slightly sweet Jin that represents both my music and my heritage. Rooibos and honey happens to be the singer’s drink; I drink a cup before every show. Oranges are inspired by the South of Portugal where we have THE most delicious oranges in the world. The second flavour combination is tomato and sweet piquant peppers. Now this is a special Jin. I love the idea of bringing food into Jin. Offering a slightly savoury vibe to one of my Jins was important because this one represents my passion for food. The peppadews also make it proudly South African. The last flavour is one I am really excited about because the flavour of this Jin is just phenomenal: olive and honey! It’s a unique flavour – slightly sweet and slightly savoury, it encapsulates both my worlds of music and food so well. How was your experience working with Beverage Emporium and Craft Link? It’s been a dream. I can’t fault it one bit. Just a great team of visionaries and risk-takers and that’s what you need. They are an incredible bunch of people with hearts of gold. Anything that’s surprised you about the production/distribution process involved in launching a new alcohol brand to the market? Yeah, plenty. It’s a new game for me. Trying to understand how to play in a market where most brands have these huge marketing budgets and I don't is quite a scary thing. But I’m a creative; I love this type of a challenge because it forces us to think outside the box and that’s where I’m most comfortable. How do you best enjoy your Jin Gin served? Either straight on the rocks, or with tonic and ice. I don't think the Jin needs garnish because I love the flavours already. It really doesn't need much. Now that you have a gin brand under your belt, what’s next for J'Something? What’s next is to focus on what I have, nurture it and grow my empire. Jin Gin is available from selected Pick n Pay and Ultra Bottle Stores and retails from approx. R390 per bottle.